Guided by the blimp, a patrol boat of the Miami Police Department scudded to the rescue scene. Blimps and even horses mount two-way radios in Miami, a city with an electronic nervous system that is as complete as the latest in modern science can make it. The Magic City was first in the nation with a unified system to handle all city communicationsâ€”fire calls, police intercom, hurricane warnings, Civil Defense and the routine business of running a metropolis. Miami’s head start is largely due to cheerful, energetic Ben Demby, a radio-electronics enthusiast who keeps his Miami Communications Department equipped with the latest advances in technology. At every stop-light intersection in Miami you’ll find an emergency telephone that allows you to summon fire trucks or an ambulance in jig time. The system, suggested by Ben Demby to Bell Telephone and installed first in Miami, is duplicated in only 10 other American towns. Demby’s Communications Department, together with Detroit and the FBI, was the first to employ Speedphoto machines to flash pictures, fingerprints and information about dangerous criminals across the country. Ben Demby, against the advice of FCC experts, was first to employ high-frequency radio in everyday use. Today, the six-foot antennas that are the mark of the old 30-megacycle radios are slowly disappearing from squad cars all over the nation. In their place appear thin little wands no longer than a man’s handâ€”the antennas of high-frequency radios that give better, surer reception. In the nerve center of the Miami Communications Department, a two-story stucco building beside Biscayne Bay, the blare of a police loudspeaker mingles with the sound of Teletypes and card-sorting machines. The crackle of an acetylene torch and the whir of a drill float in from the adjacent electronic shop. An attractive red-haired girl dispatcher in a soundproof glass booth tries to keep calm as excited squad-car police give a running account of a shooting and the chase for the gunman. Next to her, in a similar booth, a soft-spoken girl dispatcher directs a squad car to a child who has just been hurt. Banks of files along one wall hold cards with information on the 300,000 cars registered in Dade County. And spotted through all the files are thousands of pink cardsâ€” reports on all the stolen cars in the United States. An electronic card sorter that speeds through cards at the rate of 700 per minute starts a check on used cars newly registered. Moments later a card is flung out of the machine. It’s a duplicate of a pink card placed in the sorterâ€”a 1955 blue Cadillac convertible stolen in southern Georgia and sold to a dealer in Miami. Another valuable crime-fighting tool in the center is the Speedphoto machineâ€”an instrument that links Miami with 25 other major cities and the FBI. In Detroit, a 17-year-old boy ran amuck, killed his mother and sister, then headed south. He landed in Miami and was picked up by Miami police on a minor charge. Although the police had no inkling of his Detroit crime, they put his picture on the wire as a matter of routine. The boy was identified by Detroit police and he was booked on suspicion of murder within the hour. If police had depended upon air mail, the boy would have been released before it became possible to identify him. Police receive a “hot” telephone tip that a bank robber wanted for murder is headed for Miami. It’s believed he’ll stay at a certain hotel near the business district. Communications men hide the TV camera behind the hotel desk and string a coaxial cable to a room above where detectives gather around an ordinary television receiver. Two nights later, the murderer checks in. The detectives alert headquarters by walkie-talkie, a call goes out to a cruising squad car and police nab the criminal as he opens the door of his room. But the mobile TV camera is not just a police tool. Each year it’s set up on the grounds of the city golf course to give sports reporters in the clubhouse a stroke-by-stroke account of the Miami Open Tournament. A wide-angle shot of the golfer and the turf ahead turns into a close-up as the Zoomar lens goes into action and catches the almost-spent ball bouncing on the green. The camera is used as effectively for traffic checks and the relay of election returns. Of all the features of the Communications Department, Demby is perhaps proudest of the emergency telephones installed at all traffic-light intersections. The moment you pick up the receiver of one of them a light flashes on the fire-department board and you’re talking to the fire dispatcher. If you’re reporting a fire, he gets the exact address and nature of the blaze from you, looks up at a chart of the city, and engages a plug that sets one, two or a fleet of trucks rolling to the scene in 30 seconds. 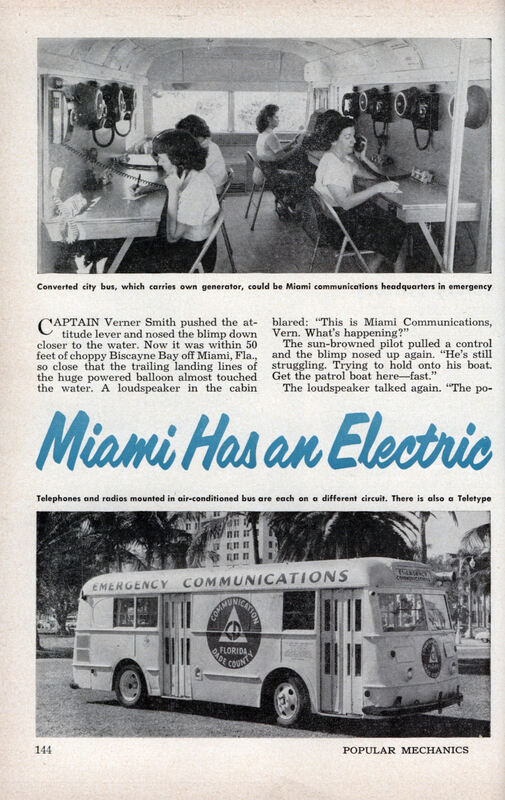 The telephone system, inaugurated by Miami in 1952, replaces the familiar red fire box still used in all but ten American cities. According to Demby, the old system took three minutes longer to alert the nearest fire station â€” enough time for a minor fire to turn into a major one. Miami mounts two-way radios on all rolling pieces of fire equipment. Once at the scene of the blaze, fire-department officers direct operations not by shouted commands but by radio. Smoke-eaters rescuing fire victims inside the blazing building carry walkie-talkies to get instructions or summon more help to squelch flames or cut through a wall. The city’s complete communications network began in 1934 when Ben Demby was placed in charge of the newly formed police communications system. But the first radios he purchased and installed in the police cars crackled, buzzed and were undependable. During the month of August, especially, the ionosphere played strange tricks on policemen operating the 30-megacycle radios. A call would go out to a cruising squad car, but the sheriff’s office in Hartford, Conn., would answer. The message would then be relayed to Hartford, which would contact the Miami patrolman who couldn’t hear his own dispatcher. Demby was convinced that a frequency of 155 megacycles would solve his problems. 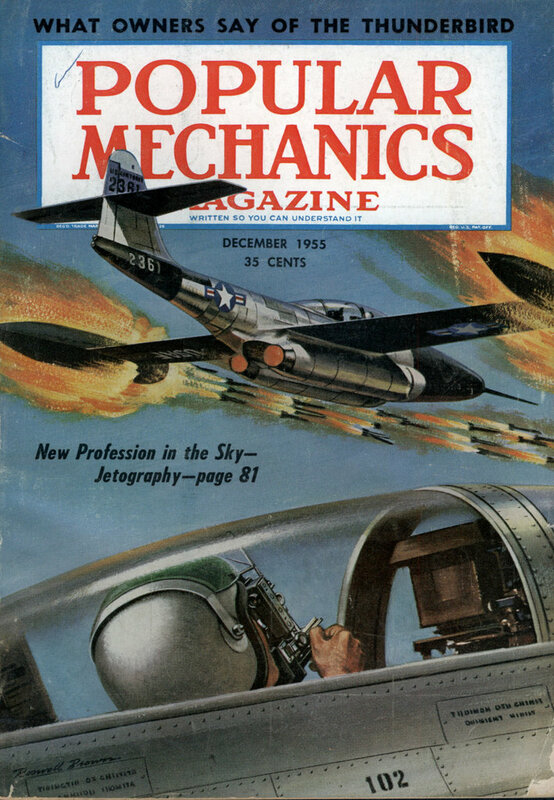 No one was using over 100 megacycles at the time, and the FCC assured him his dream was impractical. He proceeded to rip out the old radios and install 155-megacycle sets built to his design by Communications technicians. They worked fine. Later, the same opposition and the same success were repeated when Demby’s department, now expanded to cover all city communications, went to 460 megacycles. Nine Teletype machines, some of them operating on circuits to municipal “clients” as well as to local police and fire stations, are located in the headquarters of the Communications Department. Two radio dispatchers in Communications headquarters operate the county and suburban radio systems. These operators are in addition to the regular Miami operations: A telephone switchboard and a radio dispatcher in the fire department, a radio-dispatching system at police headquarters and a switchboard in City Hall that links all phones in the city government. In touch with surrounding communities, the center also has direct contact with several agencies. Pick up a telephone marked “Coast Guard” and an officer at the local Coast Guard headquarters answers immediately. Lift another receiver and a phone rings at the Strategic Air Command post in Marietta, Ga., 550 miles away. A phone call reporting bombers approaching Miami would alert the nation in 12 seconds. Meanwhile, switches in the Miami Communications Center would be pulled to set air-raid sirens sounding all over the city. Miami would start broadcasting messages over an emergency radio-communications frequency that reaches out over a 500-mile radius. The emergency communications network, invaluable in air raids, was set up to counter havoc that Miami is familiar with â€”hurricanes. In touch by Teletype and radio with the United States Weather Bureau, Demby’s department must alert the city when a hurricane veers too close. When the alert is sounded, it’s also time for the Communications Center to secure itself against wind and flood. It does this by packing bag and baggage, IBM machine and Teletype, and transferring its entire operation to a stand-by center on the third floor of the Dade County Courthouse. The job takes 30 minutes and is accomplished without a break in communications. Meanwhile, a bus converted into a rolling communications headquarters is heading for a flooded area on the outskirts of the city, ready to direct evacuation operations. Equipped with all ten radio circuits, telephones and a Teletype, it is the third line of defense in case of emergency. For it alone could function as a complete communications center for the Miami area. In certain emergencies, other than hurricanes, the radio-equipped Goodyear blimp that winters for six months in Miami could serve as a radio relay and connect Miami patrol cars with cities as far away as Day-tona Beach, 250 miles up the peninsula. The last communications center â€” the fourth line of defenseâ€”is Ben Demby’s personal automobile. Its instrument panel would make a Detroit designer turn handsprings of delight. Demby’s array of instruments, however, has a practical purpose. By lifting various receivers and turning certain dials, he can communicate by radio with all branches of his department â€”wherever he may be around Miami. All the radios in the department can also contact others on the same band. So radio communications do not depend solely on one or two transmitting towers. So in 1955 the Mayor of a major city thought it would be a good idea for the police and fire department to communicate with each other in an emergency? Ben Demby was my great-grandfather, he passed shortly before I was born.